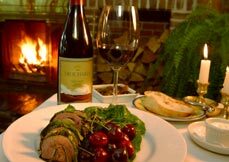 Whether you are staying as our guest at the Inn or simply joining us for dinner, we're certain you'll enjoy a memorable meal at the Deerhill Inn Restaurant. On long Summer evenings, watch the sun set behind the Green Mountains and the stars appear. In Winter-time, cozy-up beside our log fires in the glow from candles and lamps while the snow falls outside. Spring brings bright green to the wooded Deerfield Valley and our trees come into blossom. Fall Foliage offers never-to-be-forgotten vistas of red and gold. We aim to provide "friendly fine dining". Our hope is that all our guests will feel warmly welcomed and completely comfortable whether they have dressed for the occasion or chosen to dine in comfortable country clothes. We try to serve each one carefully and attentively without ostentation, and let them enjoy their dining experience in their own way. Our dinner menu is à la carte with appetizers priced $11-$17, entrées priced $20-$42, and delicious homemade desserts priced $9-$10. We offer vegetarian, gluten-free, and dairy-free options. Our Menus feature fresh local produce, and we choose meat and fish from trustworthy suppliers offering product free from hormones, additives and preservatives. We aim to offer dishes that are innovative, healthy and satisfying with a strong seasonal focus, all prepared "from scratch" in our own Kitchen. We also specialize in delectable desserts, all house-made, and we offer a wonderful selection of hand-picked local cheeses with clever accompaniments. Locally-roasted coffee and a fine selection of black, green and herbal teas complete a memorable meal. Our cellar features a careful selection of New World wines, earning the coveted Wine Spectator Award of Excellent for twelve straight years. Offerings come from some of America's finest wine-makers, as well as top vineyards in Australia, New Zealand, Chile and Argentina. Prices, though, we try to keep moderate; we want our guests to enjoy their wine and appreciate the good value. Of course if you prefer a cocktail one of our staff will be happy to mix it for you - just the way you like it. We also offer a list of both Vermont and imported beers. If you have special dining requirements, we will do our very best to look after your needs. We can offer gluten-free and dairy-free, vegetarian and vegan alternatives for our guests and accommodate most food allergies. Be aware, though, that we cannot offer a meal completely free from any possible gluten contamination for serious celiac disease sufferers. And we cannot take care of your special needs if you don't tell us about them! Please provide us advance warning, and as much information as you can, if you have special dietary requirements. 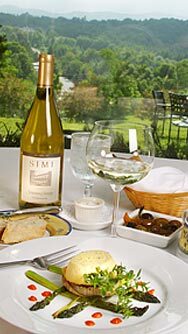 The Deerhill Inn Restaurant is not open every evening. If you are staying at the Inn, we will make sure you know our opening days and serving hours in plenty of time to plan your visit; if you are joining us from outside, please call us on 802-464-3100 to check.